Hip-Hop Caucus CEO And President Reverend Lennox Yearwood, Jr. is still confident in hip-hop’s positive influence on young voters. 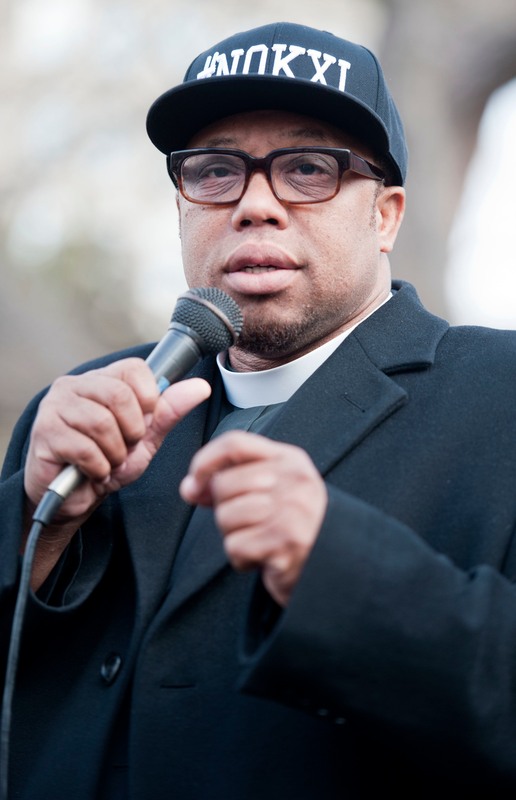 In a time where political awareness is paramount, President and CEO of Hip-Hop Caucus , Reverend Lennox Yearwood, Jr. uses the power of hip-hop to encourage voters ages 18-40, to stay engaged with the Respect My Vote campaign. In 2008, Respect My Vote registered 30,000 voters, got support from artists like Nelly, Keyshia Cole, and T.I. and 2 Chainz in 2012. "It's important to use the culture because it becomes the voice of the people. Hip-hop is not foreign and doesn't sound like a Sunday morning news talkshow," Reverend Yearwood said. This year, Respect My Vote is backed by Vic Mensa and Charlemagne Tha God and is currently on the "High Road" tour with Wiz Khalifa, Snoop Dogg, and Jhene Aiko aiming to register voters across the nation. This year, in addition to their registration effort, the group is taking a special focus on shining a light on police violence. Reverend Yearwood, Wiz, and Snoop are facilitating conversations around what they call, "High Road Politics," which intends to back legislation reform around the racial disproportions in the cannabis industry. Over the phone, Reverend Yearwood talked to The FADER about hip-hop's message for Donald Trump, why black people must vote this year, and the importance of staying engaged after a president is elected. Where’s the difference among the young people in this 2016 presidential election season in comparison to the last two election seasons in 2008 and 2012? People who are 40 years old or so or younger realize that the issue is no longer just about equality. Now they're dealing with the issues of race that are clearly still out here coupled with the issue of existence and their politics are based upon if they're going to live or not. Will they have a job? Can they pay a student loan? Can they get a house? Will they be killed because of the color of their skin? Can they get clean water? Is the water even clean at all? Is the air clean? Is there pollution? While our politics have become more sophisticated, our institutions have not. There's an institutional void and we're dealing with some systemic, institutional disparities that are being created then you need institutions to help with that. For young people and our generation, you definitely see people getting more engaged politically. As far as in the music you see much more of an earth tone that artists are trying to connect with their music and that's helpful. How would you say the role of hip-hop specifically has shifted in engaging voters in this year's presidential election? This is actually the year when hip-hop has to stand up. I've been in working in hip-hop politics since Rock the Vote back in the 2000s and the hip-hop summits with Russell Simmons and Vote or Die and What's your Choice were critical. Folks were easily motivated because President Obama was at the top of the ticket. Since his second term things have changed and the emergence of issues regarding prison reform, criminal justice, climate change and education, people have realized how vital reading up and down the ticket is. This is the year where we have to use our culture more than ever to get folks excited and explain why they have to be a part of the process. Doing policy is not easy but we have to be engaged in it because if we're not policy will certainly shape us. With President Obama people were excited to know that somebody like them, either young, hip or person of color was on the ballot at the top of the ticket. It was a little easier—no doubt that it definitely had some impact. From the killings of Trayvon Martin, Mike Brown, Rekia Boyd, and Alton Sterling, things have changed where people have realized that we can't legislate morality. In other words, we can’t make certain institutions like us, but we can definitely legislate behavior. People are seeing that demonstration was critical but now, demonstration without the legislation leads to frustration. So while people may not have the same kind of viewpoint of, “Let's just vote for President Obama,” it's personal now. They're voting now because it's about "my life" and putting policies where things can shape “my life" in the community. There’s a frustration and a sentiment in the black community where some people are discouraged to vote and won't go to the polls because there's a sentiment that their vote doesn't have any weight. What do you say to that mentality? It's ill advised and our community needs all the help that it can get. To give away our one measure of utilizing our voice, it absolutely crazy. I understand and listen, I’ve been around this for many, many years and I was a little shocked when I heard Diddy, we actually helped bring together the Vote or Die campaign, say that voting was a scam. We’d met up in Miami, we rapped a little bit in the Four Seasons and I heard his point. His point was like, "You know man there's just so much money in politics." I was like, "I understand that. We have to fix campaign finance reform. We have to weed out big money in politics. But voting is not a scam. Voting is critical." It's not just the top of the ticket or who you like. The list is endless with the folks we put in office who shape policy. Hip Hop caucus is not non-partisan, we're post-partisan. We're really beyond that party system because we want folk not to be who we endorse, but who endorses us. Not who we're with but who's with us. What do you mean by "with us?" People always ask, "Hip Hop Caucus, who are you going to endorse?" We're like, "Well, we're endorsing nobody!" More importantly it's the candidate who endorses us. We take the position where we want to educate our communities about issues that affect us so they can look at the candidate, whether it's local, state, or federal level, and they can pick the best candidate for them. Artists are responding to Donald Trump but, we cannot miss the total aspect of the political process. While we’re saying ‘F Donald Trump,’ we cannot miss that there are people who are saying ‘F’ us because they are getting the voting rights. In the past two elections, a lot of hip-hop artists have backed President Barack Obama. Now, they're not really in strong support of either of the candidates but they've definitely expressed being anti-Donald Trump. Do you think those messages are pushing people against him or pushing them to find out more about Hilary Clinton? It’s clear that Trump is a very unique candidate and people are responding to that. He’s said some things that are very much insulting. Now that he's the nominee for the Republican party, it becomes a whole different dynamic. It's like, "Wow. Does your whole party believe that?" Artists are responding to Donald Trump but, we cannot miss the total aspect of the political process. While we're saying “F Donald Trump,” we cannot miss that there are people who are saying “F” us because they are getting the voting rights. A little over three years ago in the Shelby County v. Holder case, the Supreme Court gutted provisions of the Voting Rights Act that had clearances to protect us so that ballot places wouldn't be changed or that lines weren't as long to discourage people from voting. We have to deal with the fact that we're dealing with the voter ID laws in places where they know this would hamper students in communities, senior citizens, the disabled or sometimes people who are poor and just can't get an ID. It just becomes like a poll tax. So we have to look at the whole process about what's being done to disenfranchise. While I understand the frustration with this particular candidate [Donald Trump] and other candidates who say things that are just so insulting, we can't forget that this is still real politics and real policy. What are some ways people can ensure young people stay engaged? Many folks are engaged because of the many demonstrations that are going on and that's a great way to be engaged. Also know your members of congress, know who your mayor is and your city council because technically, these folks work for you so you should know who they are. Know the politicians in your community and stay aware of who's doing what. See who's around. One of the most important things in this is make policy and democracy a lifestyle. Utilize your voice to create change whenever you see injustice and speak up because it really starts there.